Note: This counts only visible groups. If you set the “Number of groups to display per page” in the list view settings you will get max that number of groups when counting. An alternate approach would be to query the list for the total number of unique items based on the items the view is grouped by. Another great, really usable solution! hey – will this count get displayed on all the views configured once enabled. i want this for only one of the views. It is per view, but if your new view is created from “Start from an existing view”, and the existing view has the script active – it is also active in the new view. This code is very useful. 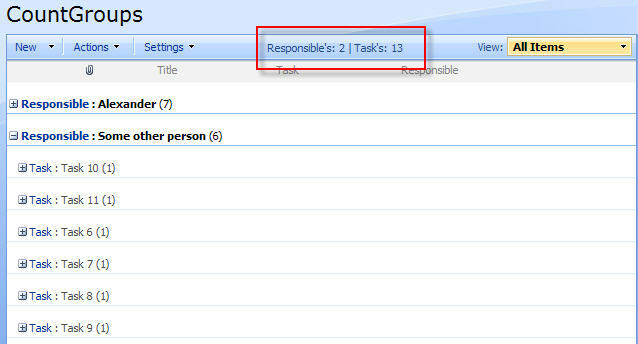 How can I modify it to also include a count of total number of unique tasks for each responsible person? Thanks in advance. This code was just a simple “count groups” script. If you want more logic, i would recommend writing a script that uses a webservice call to query the list and build the result using HTML. Doing this in a list view would be a bit to flimsy. Anyone else running into the issue of the Tasks not counting the first displayed sub group? Just like the above example I have 2 for Responsible but only showing 6 for Tasks. It is not counting the tasks under the first group (Alexander). I made a change to the code and replaces gb2 with vb2. Then I divided the CountGroup2 value by 2 and it works now. I have no idea why but I have tested it out by adding/deleting items and it seems to hold up. Thank you for this valuable post. Is it possible to read the subgroup counts? I have not looked at this one for about 5 years, but I’m not sure the subgroups are actually rendered before you expand the parent group. This means you cannot count the contents of the subgroups when the page loads. I am fairly new to SharePoint, trying to use the code above. However, it is not working for me. I pasted the code in CEWP under the list with a grouped view and modified the location of the jquery file. I also downloaded the latest 1.11.3 file and updated the script reference in the code. I don’t see any change on the page. Any suggestions? This was made for SharePoint 2007 almost 6 years ago so I’m afraid I cannot help you with it, but the code is fairly short and easy so you might be able to make it work by trial and error.